Normally, provisional production figures from the national accounts are not that interesting but this time around I do think we should keep more than a weary eye come tomorrow. Basically, governmental agencies, international organizations and others have been busy scything their projections for 2008 GDP growth in the Eurozone (see detailed Q4 07 description here). The most pessimistic was without a doubt the IMF who in their 2008 WEO raised the warning flag for the Eurozone and Eastern Europe. In this light, Thursday's figures will give an important initial yardstick of what to expect. Of course, Q1 may not turn out as bad as many bears expect but I do think that we might be in for some surprises. In case you might have forgotten the recent figures I produce the visual account below. 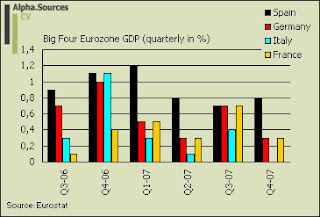 As can be readily observed the Eurozone has been steadily slowing down since the advent of 2007. Moreover, we are now witnessing notable growth divergences between the member countries much to the chagrin of the ECB as it makes the policy choice decidedly more delicate on top of a situation of stagflation. Ultimately, of course the Eurozone in its whole entity will tend to slow down albeit the fact that some will definitely fair better than others. In this present context I am consequently looking forward to a couple of things. Most commentators are in agreement that Italy slumped into a recession as early as Q4 2007 which would make it the first industrialised economy to tumble into recession (neck and neck with the US) as a result of the turning business cycle ignited by the credit crisis. Yet, we don't have concrete figures for the Italian economy going well into Q2 2008. This is a disgrace and I am wondering whether Italy will once again excel with its absence in the context of reporting statistics to Eurostat. How far down the scale will Spain (and Ireland) post their respective growth rates? In the context of the aggregate Eurozone figures Spain is particularly important since the country has been one of the main drivers of the aggregate GDP figure on the margin. It is almost certain that Spain will post a figure significantly below the reported 0.9% in Q4 2007. The question is how much will Spain have slowed down in Q1? Real economic activity has certainly contracted rather rapidly during the first quarter of 2008 but we also know that the Spanish government has been busy with their plans to prop up spending to cushion the economy. However, this is unlikely to have an impact as early as in Q1 which is also why that Spain may in fact quite possibly post a negative growth rate q-o-q come Thursday. What will Germany give us? It is important to understand that this is basically all that matters in the context of gauging not only the main trend in the aggregate Eurozone figures but also in the context of the ECB's future course. Evidence suggests that January and February were very good months for Germany where both exports and industrial production expanded at healthy clips. March on the other hand seems to mark a turning point and looking at the data we can be almost certain that the German economy contracted if measured on March alone. This means though that Germany won't publish a negative number come Thursday; far from it. However, the question is how much higher than the previous 0.3% it will be (if at all)? The consensus has it at a heady 0.7% which would clearly open up for a significant backdrop in Q2. We need to understand that at this point Germany is running almost exclusively on external demand but given the fact that the entire European edifice is slowing (Eastern Europe in particular is important here) we cannot expect Germany to continue its hitherto impressive expansion. As such, this represents my random thoughts on tomorrow's GDP release for the Eurozone (and Germany) which is somewhat more important than usual I feel. The consensus is plotting Eurozone GDP at 0.5% which would translate into a slight increase in the growth rate relative to Q4 2007. This figure is without a doubt motivated by the strong expectations for the German figure. I remain very skeptical that Germany should post such an impressive number. We will see soon enough. I will of course be moving in with more detailed analysis. 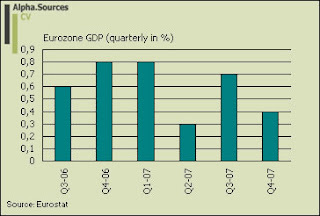 Q1-08 Eurozone GDP - A Last Salute from Germany? Have the Baltics Entered a Recession?